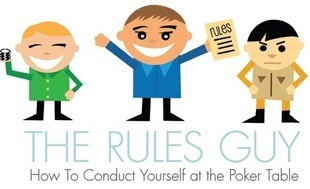 Enter “The Rules Guy.” TRG believes that civility and sportsmanship are never wrong, and that bad behavior (even when you’re simply trying to get an edge) is bad for the game. This situation occurred in a once-a-week home game where the players have played together for over a decade. I’d say the game and players are very honest and knowledgeable about the rules. The out of position player (OOP) bets the river on an AQxxx board. The in-position player says, “I have to call, I have an Ace,” and calls. The in-position player holds his cards but doesn’t show his hand, waiting to see the OOP player’s hand. The OOP player, hems and haws, and finally mucks his cards face down, saying he can’t beat an ace. The in-position player then mucks his hand without showing and scoops the pot. A big argument ensues when a noncombatant says the in-position player needs to show, that he could be “angling.” I’m pretty certain the official rule (in a casino) would be that it’s the OOP player’s responsibility to force the in-position player to show a winning hand by revealing, and once he mucks he’s forfeited the pot. (maybe this rule even changes by card room). 1) Does the fact that it’s a home game change the ruling? 2) Do you consider the in-position player’s actions an angle? (i.e., he verbalized his hand but didn’t show)? Thanks for writing in, and let TRG say first he loves how you used the word “noncombatant” to describe a poker player not in a particular hand – TRG is definitely adding that one to his arsenal. Poker is war, everyone around the table is the enemy, but whenever they aren’t in a hand, they become a noncombatant. Nice. Note also that his opponent, the in-position player (caller) is free to show, but is not obligated to since his opponent mucked without showing – unless someone asks to see his cards. He or she might show because it’s a friendly game and he had an ace. More strategically, he might show to remind the table that he doesn’t bluff all the time; conversely, he may show a stone-cold bluff. But he doesn’t have to show unless someone asks him to. Again, Krieger and Bykofsky, Rule 5.20: “Asking to see a winning hand: If, on the last round of betting, all players muck their hands except one, the pot may be shipped to the last remaining player without that player revealing her cards. But if any player at the table requests to see the winning hand, the dealer must reveal the winner’s holdings before the winning hand is mucked.” This is harder to enforce in a self-dealt home game, but it can be done. Does it make a difference that it’s a home game? Only if your home game combatants make it so. Your game, your rules, but TRG prefers home games that simulate game-time conditions (wartime conditions?). It’s worth hashing out a few ground rules and everyone agreeing to them, since the purpose of even a serious home game is camaraderie and fun. I used to play in a weekly home game tournament. Some of the players like to see the turn and river cards once the hand is clearly over. I don’t like to do this because it gives the player who folded a chance to confirm if he made the right decision. The following issue arose the other night. Post-flop, it’s just me and the dealer. I announce I am all in. The dealer has his cards in front of him with a card protector on top, immediately rolls the turn and river cards without saying whether he calls or folds and before I could ask him if he called or folded. Once he has done this, he mucks his cards. I said I just won an all in from him. He said it was obvious he folded because he did not say he called and refused to pay off. The dealer is also the host of the home game so no one else said anything, and I have now been banned from the game. So my question is should he have paid off the all in bet? Your question, Southpaw, is not should he have paid off the all-in bet. Your question is, “Should I be glad I’m not in a game run by a scumbag who routinely allows rabbit hunting?” The answer to that one is a definite yes. The answer to your actual question is much more murky. If he continues to deal – wrong, wrong, wrong, wrong, wrong on his part! – then you have a case that his inaction might constitute a call, but it’s a thin case since he has committed no chips (it’s impossible to argue with chips in the pot; make sure they’re in there before anything is done). There is absolutely no way that this would happen in a card room or any game with a dedicated dealer, but since it happened it happened. TRG actually believes him when he says it was that he’d folded (though it was far from obvious: to fold is to surrender your cards). Sorry Rules Guy...I don't know what craptacular casinos you play in but you're wrong (for the 1st rule / winner mucking without showing). Unless specifically stated, the other rule is true...the winning hand does not need to show. I actually have gone through this multiple times where I call and my opponent snap mucks. At that point, the hand is over and the winning hand does not have to show. Also, in most casinos (at least throughout the Midwest), table talk and even showing cards heads-up is 100% legal in cash games (sometimes it's even allowed heads-up in tournaments). I know because this is my #1 move, show my bottom 2 pair and see what kind of read I can get off the other guy. I've done this in casinos in Michigan, Ohio, Indiana, and Illinois...even in Las Vegas. So, sorry but this time you're wrong. They don't have to show to win, but a player at the table can request to see any muck. Most people don't do it since there's some kind of unwritten rule that it's rude, but it is legal in most Casinos. Home games are, of course, subject to their own rules.